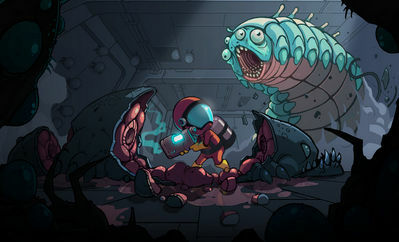 Play as an exterminator named Harry and decontaminate an infested futuristic research facility on planet Zoit. 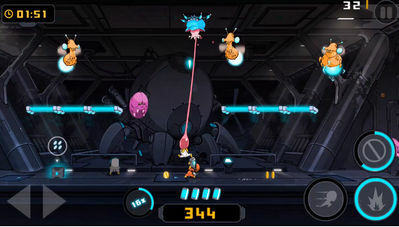 The Bug Butcher is a unique fast-paced arcade shooter that tasks players with protecting a bunch of scientists from certain death by bugs. Developed by Noodlecake Studios, the guys who made Alto's adventure, The Bug Butcher brings a whole other level of shooting fun to your Android. It features plenty of alien insects to kill, and an awesome array of weaponry to use, all wrapped up in gorgeous 2D graphics. Harry’s mission: survive until the decontamination of the building is complete, hoard coins like his life depended on it, and protect the scientists at all costs. Watch out for the spiders as they have a particular fondness for rubber encased scientists. Install Apk, Copy ‘com.noodlecake.bugbutcher’ Folder to sdcard/Android/obb and play.